MSI has recently unleashed their latest mid-range Gaming series motherboards featuring Intel’s B85 Express chipset – the MSI B85M Gaming and MSI B85I Gaming. Aside from the full ATX MSI B85-G43 Gaming that is now available, MSI has expanded their B85 Gaming series to smaller form factors such as Micro ATX and Mini ITX. Both the MSI B85M Gaming and B85I Gaming features USB Audio Power, Audio Boost, Killer LAN and a whole new software and hardware design for enhanced performance. These are basically upgraded versions or Gaming versions of the MSI B85M-G43 and B85I. Check out their features, specifications, prices and availability below. Just like their big brother B85-G43 GAMING, both the MSI B85M Gaming and B85I Gaming features high quality USB audio devices, such as external DACs, suffer from weak USB power delivery when multiple USB devices are connected, highly impacting sound quality. MSI USB Audio Power continues to deliver 5V to the USB ports on motherboards, greatly improving sound quality. The USB Audio Power design, which powers the USB ports independently, offers more stable power and better audio signals than traditional solutions. This results in much clearer sound with reduced noise, along with improved power stability for the users’ extra devices, enjoying an enriched sound presentation. 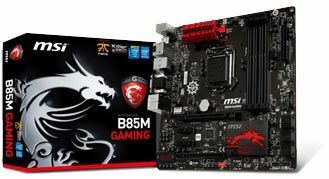 MSI also used the award-winning Military Class 4 components in both the B85M Gaming and B85I Gaming. Military Class 4 is the next step in high quality components. Hi-C CAPs, Solid CAPs, Dark CAPs, together with SFC and Dark Chokes, ensure the system runs stable under extreme conditions. These key components have all passed extreme testing ensuring stable operation in the harshest environments. The core of Military Class 4 is based on the essential elements which increase your stability in the worst conditions, featuring humidity protection, high temperature protection, EMI protection and ESD protection. Ensure years of worry-free gaming with MSI GAMING series. Both the MSI B85M Gaming and B85I Gaming are also equipped with many exclusive new technologies, including the one-second overclocking OC Genie 4, the world’s first graphical controlled interface Click BIOS 4 and the Command Center software that combines features such as monitoring, tuning and controlling of your hardware. The unprecedented level of flexibility and control offered in MSI’s unique hard- and software design puts you in the driving seat of your motherboards configuration. 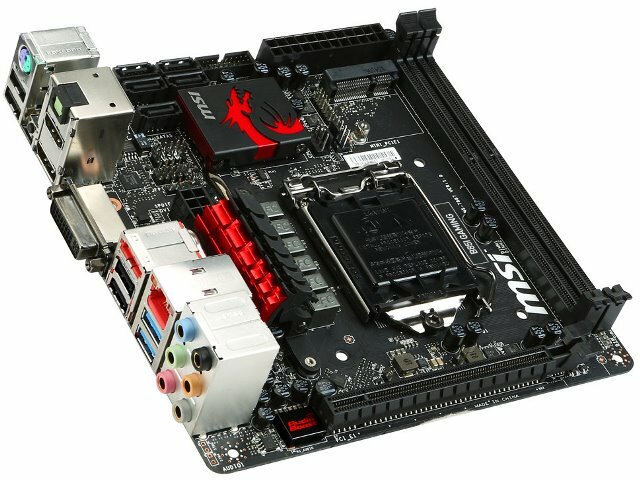 Currently the complete specifications of the MSI B85M Gaming are not yet available. Even its press photos are unavailable. I’m not sure why MSI didn’t make this information and pictures available yet. But I manage to find a tiny image of the B85M Gaming below. 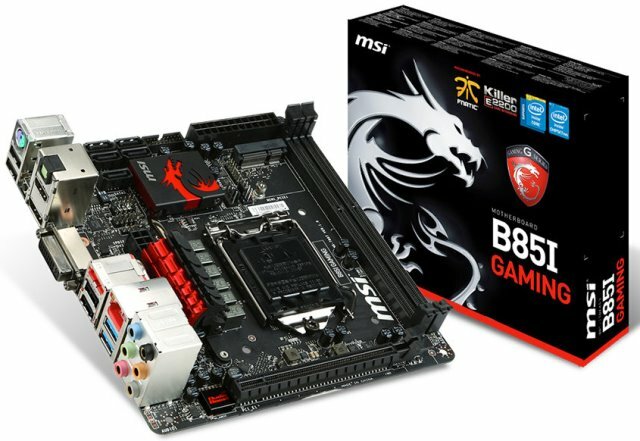 As of to date, there is no information yet regarding the prices of the MSI B85M Gaming and B85I Gaming. But it is expected to become available in the following days or weeks to come, since the full ATX variant which is the MSI B85-G43 GAMING is already available here with a $99.99 price tag. Currently their non-Gaming counterpart, the B85M-G43 and B85I are priced $74.49 and $79.69 respectively. Expect that the Gaming series will be priced somewhere in between those prices and the $100 margin. I’ll post an update once the B85M Gaming and B85I Gaming motherboards becomes available to order online.